Dapayk is a producer and live act to be reckoned with for the last ten years. Starting in comfortable Thuringia the Berlin based musician can now look back on a decade of his work. So Dapayk’s label Mo’s Ferry Prod. 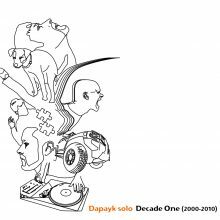 gives us „Dapayk solo – Decade One (2000-2010)“ – a double album wrapped up beautifully with a thick booklet of pictures taken on the road over the last ten years. On CD #1 he once again masters the balancing act between Techno, House and a hint of Broken Beats and combines brand new tracks with refreshed classics. With this album Dapayk is taking a stronger approach on Jazz and classic film score influences which already played an important role on his former album „Devil’s House“. The second CD contains remixes of various Dapayk projects, like Dapayk solo, Dapayk & Padberg or Dapayk & Midnight that were contributed by artists such as Dominik Eulberg, Format:B, Oliver Koletzki, Florian Meindl, Pan Pot, Heinrichs & Hirtenfellner, Exercise One, Olene Kadar and From Karaoke to Stardom to mention only a few.